Summer is coming!!! I cannot be more excited!!!! Every year, I stress out about how I am going to get all of my packets together for students to practice over the summer. My first few years, I would copy pages specifically for each student. This was really time consuming, and I found that students were really not completing the work. My packets started getting smaller and smaller, and I didn't really feel like I was sending home things that were interesting or engaging. I decided that if I could get my students to at least think about their speech or language for a few minutes every day, it would be better than the practice I was getting from them in previous years. 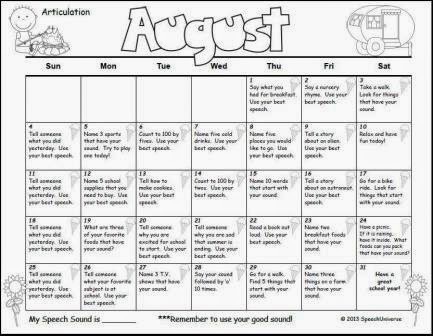 A few minutes a day over the course of the whole summer, could add up to a bunch of time focusing on speech or language! 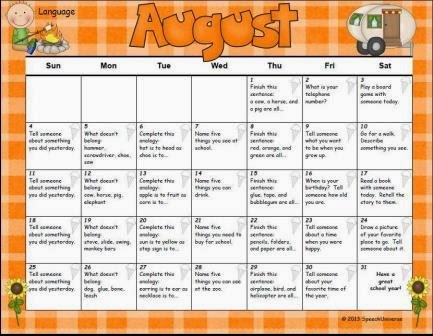 So, I started to create some summer calendars for both speech and language and passing them out at the end of the year. In the fall, parents started to approach me, saying how much they enjoyed the activities. None of them took very long, and they were engaging. I have used these calendars for two years now, and throughout the year, I still have parents comment on how much they liked them during the summer months! Here is what I am going to pass out to my students this year. 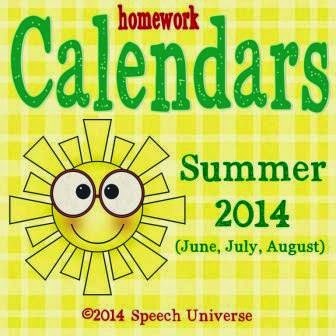 A Summer of Speech and Language: Calendars. I have both an articulation and a language version specific to 2014. I created all of the calendar pages in both color and black and white because sometimes color ink is at a premium. Students can either cross off days as they complete tasks, or color in an icon that is in the corner of each day. I also created a parent letter that goes home with the packet. This year, for my older articulation students, I may also send home pages from my No Frills Articulation packets. These are also a quick way for students to practice. This is more of my older way of doing summer practice, but for some students it still works. I will probably only do this for the parents that actually request extra work. ****Please note**** If you have purchased my Year of Speech and Language Calendars, you already own these summer calendars!!!! Also, when you purchase these calendars, you are also purchasing future years calendars too. I will update these every year so that you can have a current years calendar instead of a generic weekly calendar. I am so excited for summer on so many different levels! I am looking forward to a summer of fun with my two boys. I will also be confident in knowing that for a least a few minutes a day, my students will be thinking about their speech or language.